While pastel and neon nails are all the rage, they aren't always the most flattering on all skintones. 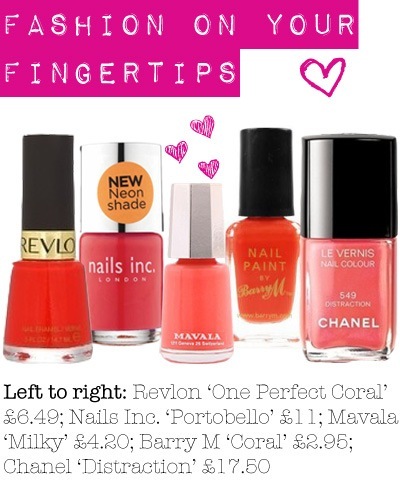 A new, equally fashionable colour to try is coral. It is zesty and bright and great for this Spring sunshine, but it actually flatters most skintones! I love the Nails Inc. one, my choice for a recent manicure, but when it started to chip after TWO DAYS (not impressed, sorry, really not!) I bought the cheaper Barry M colour for top ups and it was just as good, though the consistency is not as thick and thus requires more coats. Give it a try for a mid-week pick-me-up!